Successfully Added MP3 + Bluetooth Player Sunglasses - 512MB Flash Memory to your Shopping Cart. Gadget Sunglasses with an 512MB MP3 Player and wireless Bluetooth headset built in. Built discreetly into the cool looking lightweight sunglasses frames are, on one side, an MP3 and WMA player, and on the other side a Bluetooth headset which can be paired with a mobile phone to enable to you listen and speak. 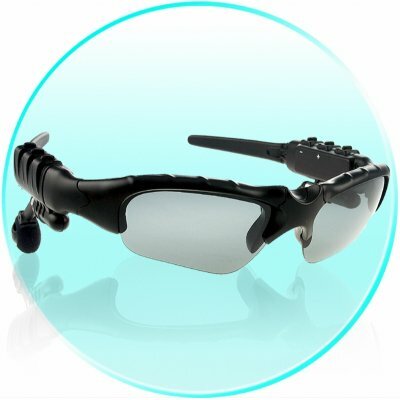 This music and communication device features fully adjustable earphones attached to the glasses frames, a built in MIC for speaking, and easy control for both the MP3 player and the Bluetooth headset. Take your music with you in the coolest way possible, and leave the mobile phone in your pocket where it belongs with this Made in China music and communication device. Colours available- Silver; Black: Please specify the colour(s) you require using the comments box in the online checkout process..